expenditures for pollution abatement equipment. SLB also holds the view that natural gas-fired power plants that use the combined-cycle technology, CCGT, should be installed to the maximum extent possible due to the low capital cost, low operating cost, effective load-following ability, and almost zero pollution. These views are based on the best data available, both recent past and current. Despite being data and evidence-based, these views provoke howls of outrage from many commenters on other blogs. In the midst of all this, the Secretary of Energy, Rick Perry, has proposed that the US provide yet another subsidy for nuclear plants and coal plants. The basis for that new subsidy is the supposed benefit to electric power grids from steady, almost continuous baseload power that the nuclear plants and (some) coal plants provide. That topic will be the basis for another post, however. It should be noted that a grid does not need nuclear power for baseload, indeed, several states and many grids have no nuclear plants operating. Also, coal-fired power plants are not required for baseload for a stable grid. 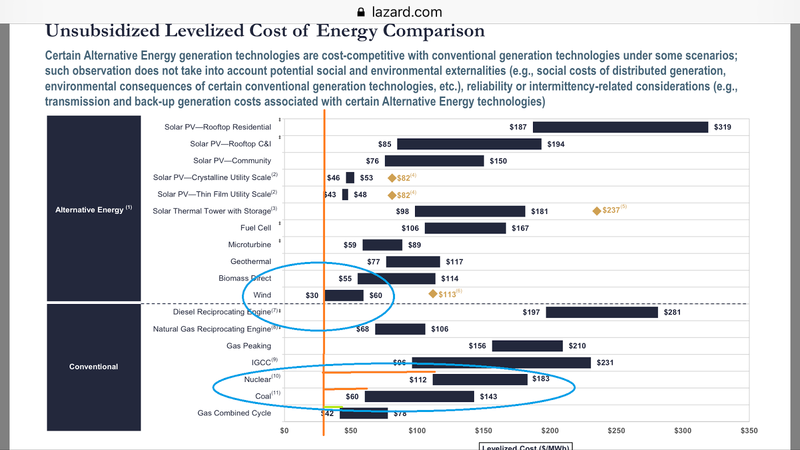 Lazard has (on p. 17) a brief description of how it calculates the LCOE, Levelized Cost of Energy: for each technology, using installed capital costs, operating costs, financing via debt and equity, Lazard solves for the $/MWh that provides the required Internal Rate of Return (IRR) for the equity investors. This is a sound methodology, one that SLB has also used in such calculations. Note that the Lazard LCOE is a leveraged financing calculation, for example in Wind power, 60 percent debt is allowed at 8 percent per year (presumably long-term bonds), and 40 percent equity is at 12 percent (presumably Preferred Stock with a 12 percent annual return). This is a slightly more complex calculation than others use, where the $/MWh LCOE is determined with a simple 10 percent return on installed costs, plus all operating costs. (But, note that the Lazard cost of capital for Wind is then 9.6 percent (0.6 x 8 + 0.4 x 12 = 9.6), almost the same compared to the simpler case of 10 percent). The primary results, as shown in Figure 1 above, show that Wind LCOE, unsubsidized, is $30/MWh, (3 cents per kWh). The vertical red line shows that literally nothing, renewable or conventional technologies, has a lower LCOE. A note on the unsubsidized aspect of the Lazard study. First, the results for nuclear power plants are entirely suspect because nuclear plants would not be built at all, absent a huge number of subsidies. Several articles on SLB discuss the many and quite substantial subsidies that nuclear plants enjoy, summarized here as very limited liability from a meltdown and radiation-induced harm, construction loan guarantees, direct Federal payments for all power produced at 2.3 cents per kWh (for the first 10 years of operation), safety regulations relaxed to allow plants to continue operating, protection from almost all lawsuits during construction, laws changed to allow builders to charge existing customers for construction funds, state funding in the millions per year to "preserve jobs" and keep uneconomic nuclear plants operating, and Federal payments for spent fuel disposal and handling. It is also not quite clear on the coal plant LCOE, if these include or exclude pollution abatement equipment - not including Carbon Capture and Storage, or CCS. If no pollution abatement costs are included, then the LCOE is too low because that is a form of federal subsidy. Finally, a note on the low-end costs of nuclear power: Lazard shows installed costs of $6,500 per kW (low end), and $11,800 at the high end (study, p. 11). Certainly in the US, no nuclear plant could be built for under $10,000 per kW, so the low end figure is suspect. Part of the trouble is the time for construction, 69 months (study, p. 20). New nuclear plants in the US and Europe require at least double that, more than 10 years. The Lazard study has some questionable assumptions that produce the LCOE for Wind, at $30/MWh for the low end. Per p. 19, that is based on on-shore, installed cost of $1200 per kW, and 55 percent annual capacity factor. DoE annual reports thus far have nothing quite so optimistic, instead having $1600 per kW, and 38 percent capacity factor in the best areas. It is not clear to me exactly how Lazard obtained the low-end data for Wind. The results for wind, onshore and with 2016 results, should be approximately $43 per MWh (since projects are operating today with that total sales price). For US policy makers, it must be noted that the nuclear LCOE of $112 per MWh, low-end per Lazard v. 11.0, is essentially unattainable. Still, it is nice to see such a study. The general impression that wind is cheaper, and nuclear more expensive, is correct. Other studies have also arrived at the same conclusions.